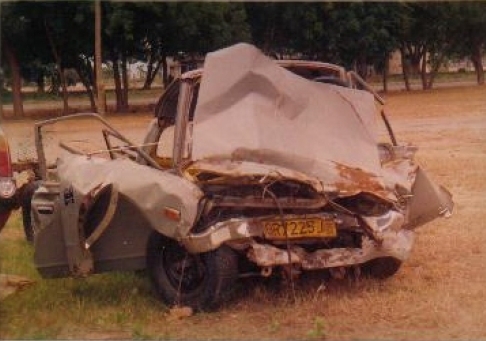 Reverend Narh was involved in a horrific accident while preparing to go to South Africa for a prophetic conference. After picking up his airline tickets in Accra (the capital at Ghana), he headed toward Somanya to inform his parents of his travel plans Fifteen minutes into the trip, the vehicle he was in (a Datsun pick-up mini-bus was hit head on by speeding Peugeot Caravan. Both vehicles were overloaded with passengers, and a front tire blew out on the Caravan causing the driver to lose control and hit the Mini-bus head on. 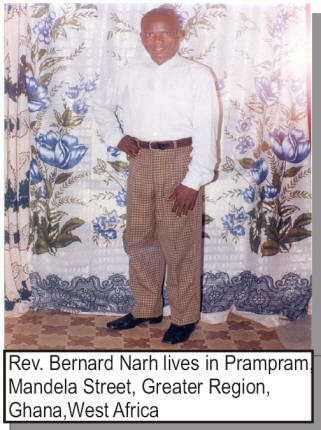 When Reverend Narh first boarded the Mini-Bus, he sitting In the front at the vehicle, but due to the extreme heat, he felt he should relocate to the cooler “bucket” compartment at the back of the vehicle. When he gave up his front seat, he asked the man next to him to save his space, and he would come back to the front as the vehicle filled. As chance would have it, the girlfriend of the man next to him boarded, and wished to remain next to her boyfriend up in the front compartment. Reverend Narh graciously gave that seat to the young lady. Reverend Narh writes: “The Lord designed that to save me from an Imminent death. The couple knew not that they were going to perish in 15 minutes time.” When the young Lady boarded the vehicle, Reverend remained in the back “Bucket” compartment. Fifteen minutes later the accident occurred and the Bucket was torn off the vehicle. 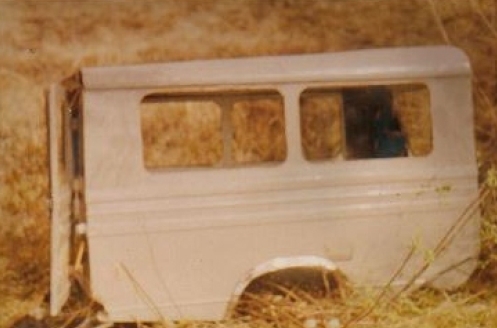 The aftermath of the accident was fatal, 11 souls perished in the Datsun Mini-bus, and 9 souls perished in the Peugeot Caravan. Miraculously, because he had relocated to the Bucket, Reverend Narhs life was spared. 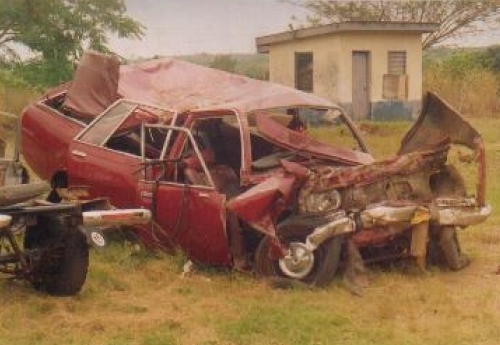 This is the "Bucket" that saved Reverend Narh's life in the accident. It was torn away from the main vehicle upon impact. All eleven in the main vehicle perished.